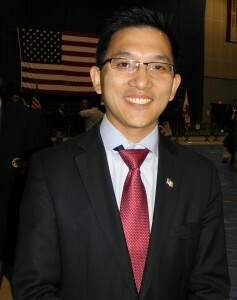 FULLERTON — Jay Chen, the Democratic candidate in the 39th Congressional District, is reporting that he has been the target of anti-Asian emails and phone calls as the campaign enters the home stretch. Chen, who has been elected twice to the Hacienda-La Puente School Board and serves as an intelligence officer with the U.S. Navy Reserve, is running against the Republican incumbent, Ed Royce. The district includes Brea, Buena Park, Chino Hills, Diamond Bar, Fullerton, Hacienda Heights, La Habra, La Habra Heights, Placentia, Rowland Heights, Walnut, and Yorba Linda. Sam Liu, Chen’s campaign manager, said the latter message was reported to law enforcement in Fullerton and Rowland Heights because it contained a threat of violence. Jay Chen’s campaign released this photo of an anti-Chen sign in La Habra Heights. 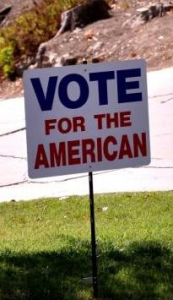 Chen’s campaign also released photos of signs reading “Vote for the American” in La Habra Heights on Encanada Drive and “Is Mr. Jay Chen a closet commie?” in Fullerton on Euclid at Valencia. In addition, signs have been ripped off the outside of Chen’s campaign headquarters, although it was unclear if the motivation was racial. An illustration shows bags of money traveling from Shanghai and Hong Kong to the U.S. A photo of Jay Chen wearing dark glasses is included. 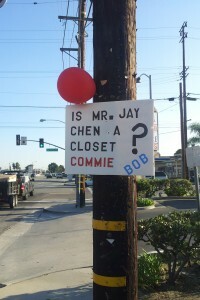 Jay Chen’s campaign released this photo of an anti-Chen sign in Fullerton. According to KTLA, the Royce campaign released a statement Monday denying any connection to the hate speech and suggesting these reported incidents may be a ploy to discredit the incumbent. In his defense, Royce has pointed out his endorsements by Chinese American and other Asian American elected officials, including Diamond Bar Mayor Ling Ling Chang, Walnut Mayor Mary Su, Rosemead Mayor Steven Ly, Placentia Mayor Jeremy Yamaguchi and Orange County Supervisor Janet Nguyen.